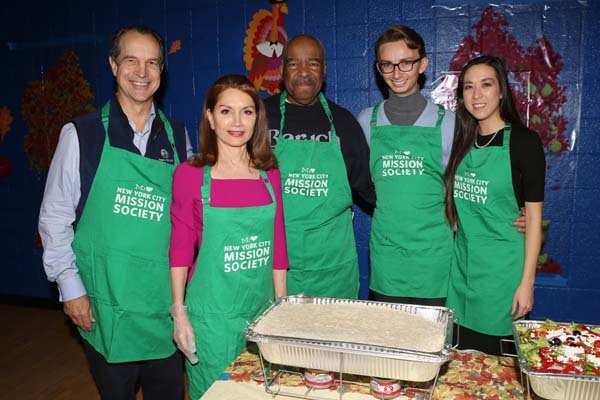 (New York, N.Y.) – Striving to help its program participants and community members start the holiday season with a hot meal, the New York City Mission Society provided more than 300 meals at its 14th Annual Thanksgiving Harvest Community Dinner at Minisink Townhouse on Thursday, November 16. New York City Mission Society alumni and staff, Board Members, community members, and volunteers served the meals, while students in the nonprofit’s afterschool free music education program, GRIOT, performed onstage in the auditorium. This event has been underwritten by Board Members Jean Shafiroff and Jay Moorhead. Sponsors and volunteer groups included Chase, Nike, Kohl’s and Whole Foods. New York State Senator Brian Benjamin greeted attendees, and Reverend Anthony Iroh of St. Charles Borromeo Church delivered an invocation before everyone sat down to turkey, stuffing, side dishes, desserts, and beverages donated by area businesses and individuals. Earlier in the week, the Mission Society continued its tradition of distributing turkeys to community members to help create a festive Thanksgiving. The turkeys were donated by St. Francis Food Pantries & Shelters.